What Utilities Are Commonly Found Underground? The principle goal of utility location is to identify hidden utilities or utilities that are not accurately mapped, thus making the process of moving the soil safer. 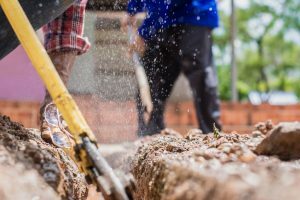 Buried underground utilities that are excavated into during construction or landscaping projects cause not only unnecessary extra costs and delays, but often lead to dangerous situations and injuries. Underground cable utility locate Denver service providers use non-invasive techniques and devices, such as ground-penetrating radars, aerial imaging and concrete X-ray, devices that detect electromagnetic conductivity and any emission that are still there even though the cable or pipe is no longer is use are also parts of the location technology. Locator devices can not only identify underground utilities, but they can also determine their exact depth and size. The process will not end when all the hidden pipes and cables in the analyzed area are identified – the utilities will be marked with special tape and other signs on the surface of the ground to help construction workers and machine operators avoid danger zones.